Most Christians in the West know little about the dangers believers face in other parts of the world. 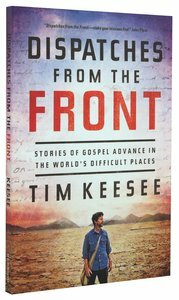 Tim Keesee, a veteran missionary and executive producer of the award-winning Dispatches from the Front DVD series, leads readers to experience global Christianity, exploring the faith and lives of Christians living in some of the world's most perilous countries. The incredible accounts included in this compelling travelogue&-stories that span the globe from China to Afghanistan&-highlight the bold faith and sacrificial bravery of God's people. Ultimately, Dispatches from the Front magnifies Christ's saving work in all the earth, encouraging Christians to stand firm in the gospel and joyfully embrace their role in its unstoppable advance! About "Dispatches From the Front"
Customer Reviews For "Dispatches From the Front"
I'm listening to the Audio book. What an investment! I find myself sharing everything Tim tells me to anyone who will listen. For more details, 9Marks has an excellent review. As you readlisten you will find yourself taken all over the world to the most unexpected places to meet all kinds to great disciples of our Saviour. DON'T MISS THIS EXTREMELY ENCOURAGING BOOK! !